Floralytes are truly one of the easiest and most cost-effective ways to add accent lighting to centerpieces and other wedding décor. Even if you’re planning a different kind of party or event, the colorful illumination of Floralytes can really make tables shine. So what are Floralytes and how can you use them to make a gorgeous glowing centerpiece? Floralytes consist of a small power source attached to a tiny bulb. 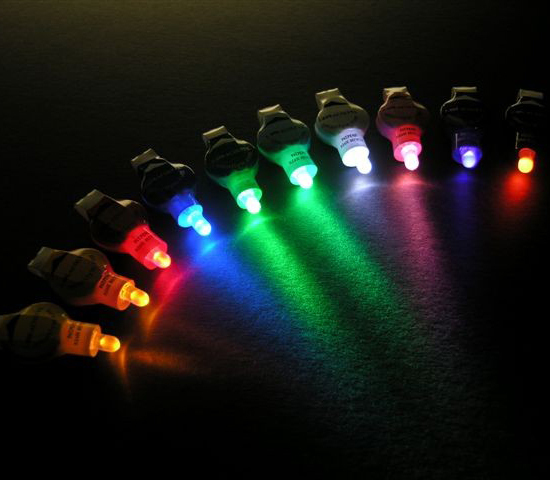 They are available in a rainbow of colors, including amber, teal, green, blue, red, pink, UV purple, orange and pure white. They are designed for one-time use, which means you can throw them away after the event. To get the most out of your Floralytes, you should create a centerpiece design that allows the tiny light to be hidden within or among other décor. This produces a natural looking glow that seems emanate from flowers, vases, vase fillers or whatever you are lighting up. One of the easiest and most eye-catching ways to build a handmade centerpiece that uses Floralytes is to start with an ostrich feather kit. Each kit contains everything you need to assemble a full ostrich feather centerpiece – just add the light! Floralytes come with a long string that can be tied to the bottom of the foam bouquet holder handle included in the kit. Just attach then slide carefully into the vase. The bulb stays hidden yet emits a gorgeous glow that will really grab attention!